aFrom the J. Philip Kistler Stroke Research Center (A.C., A.B., A.K., K.M.F., K.L.F., N.S.R. ), Department of Neurology, Massachusetts General Hospital, Boston, MassachusettsbDivision of Neurology (A.C.), Department of Medicine, Faculty of Medicine, Chulalongkorn University, Bangkok, Thailand. BACKGROUND AND PURPOSE: The severity of white matter hyperintensity, or leukoaraiosis, is a marker of cerebrovascular disease. 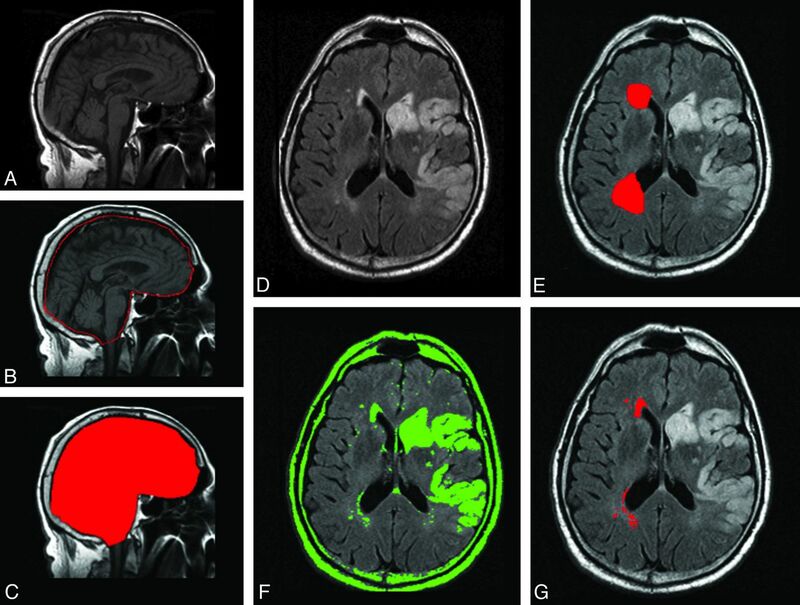 In stroke, WMH burden is strongly linked to lacunar infarction; however, impaired cerebral perfusion due to extracranial or intracranial atherosclerosis may also contribute to WMH burden. We sought to determine whether WMH burden is associated with extracranial or intracranial stenosis in patients with AIS. MATERIALS AND METHODS: Patients with AIS with admission head/neck CTA and brain MR imaging were included in this analysis. “Extracranial stenosis” was defined as >50% stenosis in the extracranial ICA, and “intracranial,” as >50% stenosis in either the middle, anterior, or posterior cerebral arteries on CTA, on either side. WMHV was determined by using a validated semiautomated protocol. Multiple regression was used to assess the relationship between WMHV and extracranial/intracranial atherosclerosis. RESULTS: Of 201 subjects, 51 (25.4%) had extracranial and 63 (31.5%) had intracranial stenosis. Mean age was 62 ± 15 years; 36% were women. Mean WMHV was 12.87 cm3 in the extracranial and 8.59 cm3 in the intracranial stenosis groups. In univariate analysis, age (P < .0001), SBP and DBP (P = .004), and HTN (P = .0003) were associated with WMHV. Extracranial stenosis was associated with greater WMHV after adjustment for intracranial stenosis (P = .04). In multivariate analysis including extracranial stenosis, only age (P < .0001) and HTN (P = .03) demonstrated independent effects on WMHV. CONCLUSIONS: In our cohort of patients with AIS, age and HTN were the strongest determinants of the WMHV severity. Future studies are warranted to unravel further association between WMHV and cerebral vessel atherosclerosis. We sought to determine whether the burden of WMH measured as MR imaging–detectable WMHV is associated with the radiographic evidence of extracranial or intracranial stenosis in patients with AIS. We selected subjects from consecutive patients with AIS older than 18 years of age with CTA of head and neck and a brain MR imaging completed on admission to our hospital between January 1, 2008, and January 1, 2009. A total of 201 subjects met the inclusion criteria. “Ischemic stroke” was defined as an acute vascular syndrome with evidence of cerebral infarction on DWI completed within 48 hours from symptom onset. All patients were assessed prospectively on admission and at 3- month follow-up. On admission, the NIHSS score was assessed as part of the AIS evaluation in the emergency department. Vascular risk factors, including HTN, DM, hyperlipidemia, CAD, and AF, were collected by patient or proxy interview or medical record review. Variables were defined as in prior publications.14 The first available SBP, DBP, and creatinine levels measured on admission were recorded. Stroke subtypes were classified by using the TOAST criteria, which included large-artery atherosclerosis (embolus/thrombosis), cardioembolism (high-risk/medium-risk), small-vessel occlusion (LACUNE), stroke of other determined etiology, and stroke of undetermined etiology (Table 1).15 All patients or their health care proxy gave informed consent to take part in the ongoing prospective hospital-based cohort studies that were approved by the local institutional review board. CTA of the head and neck was performed by using a helical scanner (HiSpeed Advantage; GE Healthcare, Milwaukee, Wisconsin) as part of the emergency AIS evaluation. “Extracranial stenosis” was defined as evidence of >50% stenosis in the extracranial ICA based on NASCET criteria,16 and “intracranial,” as >50% stenosis in either the middle (M1), anterior (A1), or posterior cerebral arteries (P1) on CTA, on either side (Fig 1). CTA measurements were performed by a reader (A.C.) blinded to clinical data and WMHV measurements. CTA definition of extracranial and intracranial large-vessel stenosis. 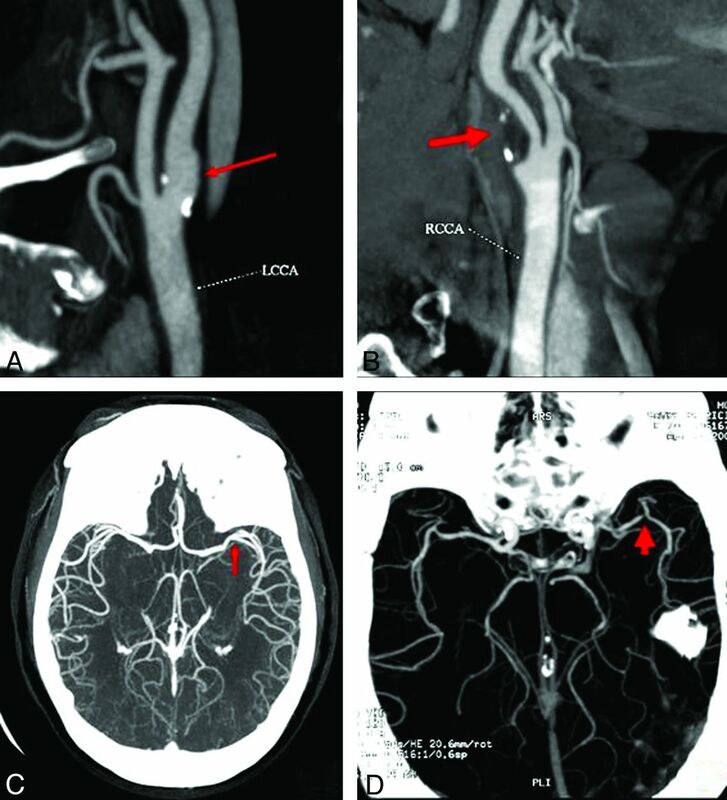 Compared with the nonobstructive ICA disease (A), extracranial carotid artery stenosis was defined as evidence of >50% stenosis based on the NASCET criteria (B). Similarly, compared with the large intracranial vessel disease (<50%, M1, C), intracranial stenosis was defined as >50% stenosis in either the middle (M1) (D), anterior (A1), or posterior cerebral arteries (P1) on CTA, on either side. MR imaging was performed by using 1.5T scanners (Signa, GE Healthcare). We used MRIcro software (University of Nottingham School of Psychology, Nottingham, UK; www.mricro.com) to convert scans from DICOM into Analyze format and for computer-assisted determination of WMHV.17⇓–19 Volumetric analysis of WMHV was performed on the T2 FLAIR axial sequences using a previously described semiautomated method (Fig 2).18⇓–20 To avoid confounding by the presence of focal white matter changes due to index stroke and to aid discrimination of infarcts from WMH, we simultaneously viewed DWI, ADC, and T2 FLAIR sequences. Total WMHV was measured from the hemisphere unaffected by AIS based on the previously validated protocol.18 All WMHV measurements were performed by readers blinded to clinical data and the results of large-vessel stenosis assessment. Volumetric analysis of WMH in patients with AIS. Left: for each subject, the T1 sagittal sequence of admission brain MR imaging (A) is used to outline the 2 adjacent median sections (B). The combined volume of these sections is used to calculate the intracranial area (C), a validated marker of intracranial volume. Right: T2 FLAIR axial sequences are examined for the presence of WMH (D). Regions of interest representing leukoaraiosis are outlined in the hemisphere contralateral to the acute infarct (E), and a semiautomated intensity filter is applied to all consecutive supratentorial axial FLAIR sections (F). The intersection between the initial region of interest and the intensity filter is examined by an operator trained to edit the final region of interest (G) and to finalize the WMH volume calculations adjusted for head size by using the intracranial area. All continuous numeric variables are expressed as mean ± SD, with the exception of WMHV, creatinine level, and NIHSS scores, which are expressed as medians (IQR). WMHV was normalized for linear regression analysis by using lnWMHV. Univariate linear regression analysis was used to analyze the relationship between dichotomous and continuous variables and lnWMHV. Three multivariate linear regression models were built to test for independent predictors of lnWMHV. Model 1 included all univariate predictors with P < .2. Model 2 included the additionally forced in intracranial arterial stenosis, whereas model 3 was an exploratory model of the effect of a subtype of large-artery stenosis on WMH burden. P value <.05 was considered significant for all analyses. All statistical analyses were performed by using SAS software (SAS 9.2; SAS Institute, Cary, North Carolina). A total of 201 consecutive patients with AIS with admission head and neck CTA and brain MR imaging suitable for WMH volumetric analysis were included in the study. Baseline characteristics are shown in Table 1. Mean age was 62 ±15 years; 36% were women. Smoking (60.1%) and HTN (59%) were the leading vascular risk factors in this cohort, followed by hyperlipidemia (42%). Among these patients, 80 (40%) had cardioembolic, 50 (25%) had large-artery, 36 (18%) had undetermined, 27 (13.5%) had small-vessel, and 8 (4%) had other TOAST stroke subtypes. Median WMHV was 5 cm3 (IQR, 2.5–10.7). Based on predefined CTA criteria, 51/201 patients (25%) had extracranial, whereas 63/201 (32%) had intracranial stenosis. Mean WMHV was greater in patients with extracranial (12.87 cm3) compared with intracranial stenosis (8.59 cm3). In univariate analysis, age, SBP, DBP, and history of HTN were significantly associated with lnWMHV (P < .0001, .0003, .0041, and .0003, respectively), whereas extracranial stenosis demonstrated a trend for association with lnWMHV (P = .05) (Table 2). In multivariate analysis (Table 3), age and SBP (both P < .0001) were independently associated with lnWMHV in model 1. Including intracranial stenosis into multivariable regression did not alter the results (model 2). Adjusting for the independent effect of extracranial and intracranial stenosis on WMH burden in model 3 demonstrated that extracranial but not intracranial stenosis was independently associated with lnWMHV (P = .04). Although previous studies showed that leukoaraiosis is strongly related to small-vessel disease,5⇓–7 conflicting findings regarding the association between WMH and AIS subtypes have been reported. A study in Korean patients with ischemic stroke found that leukoaraiosis was predominately associated with large-artery stroke subtype.12 In that study, WMH burden was assessed by using an ordinal visual scale, and prevalence of severe WMH was 55% in large-vessel, 30% in small-vessel, and 14% in cardioembolic stroke subtype groups. On the other hand, a study in Chinese patients with AIS did not show a relationship between large-artery stenosis and WMH lesion burden.36 Most interesting, none of the previously published studies implicated diseased posterior cerebral vasculature in WMH severity or its burden accumulation. The strength of our study is in using a validated highly accurate semiautomated protocol of WMHV assessment that allows detailed quantification of the WMH burden and stringent quality control. Furthermore, we used CTA to determine the degree of large-vessel stenosis, which is also known to have higher accuracy, compared with other noninvasive methods.16,47 The limitations of our methods include relatively constrained technical ability to separate WMH resulting from chronic lacunar strokes versus that of “true” leukoaraiosis by using conventional MR imaging sequences. However, the overall accuracy of the WMH measurement by using our operator-mediated quantitative approach is reassuring with regard to its specificity. Other limitations include the inherent drawbacks associated with a retrospective study design and a relatively small study size, which likely limits our study power. However, despite its modest size, our study may provide important clues to the direction of future research in this important area. Atherosclerosis of the cerebral vasculature may play an important role in the severity of WMH among patients with ischemic stroke and large-artery disease. In our cohort of patients with AIS, age and HTN were the strongest determinants of the WMHV severity; however, future studies are warranted to investigate whether this link has an independent and significant role in the biology of the WMH disease in this patient population and across various ethnicities. This work was supported by the National Institutes of Health–National Institute of Neurological Disorders and Stroke (K23NS064052, N.S.R. ; P50NS051343, K.L.F. ), the American Heart Association/Bugher Foundation Centers for Stroke Prevention Research (0775010N), and the Deane Institute for Integrative Study of Atrial Fibrillation and Stroke. Disclosures: Alessandro Biffi—UNRELATED: Grants/Grants Pending: American Heart Association. Karen Furie—UNRELATED: Consultancy: Quintiles. Accepted after revision November 10, 2011.